Many significant archaeological discoveries are made during construction. This can be private construction, road work, improvement of water or gas lines, or large construction projects. The most recent announcement comes from the area of Beth Shemesh (Bet Shemesh, Beit Shemesh). The Israel Antiquities Authority released the following information Thursday. An archaeological survey conducted on foot along the hills south of Bet Shemesh brought to light remarkable finds. During the survey blocked cisterns, a cave opening and the tops of several walls were visible on the surface. These clues to the world hidden underground resulted in an extensive archaeological excavation there that exposed prosperous life dating to the Byzantine period which was previously unknown. The compound is surrounded by an outer wall and is divided on the inside into two regions: an industrial area and an activity and residential area. An unusually large press in a rare state of preservation that was used to produce olive oil was exposed in the industrial area. A large winepress revealed outside the built compound consisted of two treading floors from which the grape must flowed to a large collecting vat. The finds revealed in the excavation indicate the local residents were engaged in wine and olive oil production for their livelihood. The impressive size of the agricultural installations shows that these facilities were used for production on an industrial-scale rather than just for domestic use. In the residential portion of the compound several rooms were exposed, some of which had a mosaic pavement preserved in them. Part of a colorful mosaic was exposed in one room where there was apparently a staircase that led to a second floor that was not preserved. In the adjacent room another multi-colored mosaic was preserved that was adorned with a cluster of grapes surrounded by flowers set within a geometric frame. Two entire ovens used for baking were also exposed in the compound. The directors of the excavation believe the site is a monastery from the Byzantine period. The photo below provides an aerial view of the complex. Byzantine compound near Ramat Bet Shemesh. Photo: Griffin Aerial Photography, IAA. Based on the driving instructions provided by the IAA, I can show you the general area. My photo was made from the top of Tel Azekah. 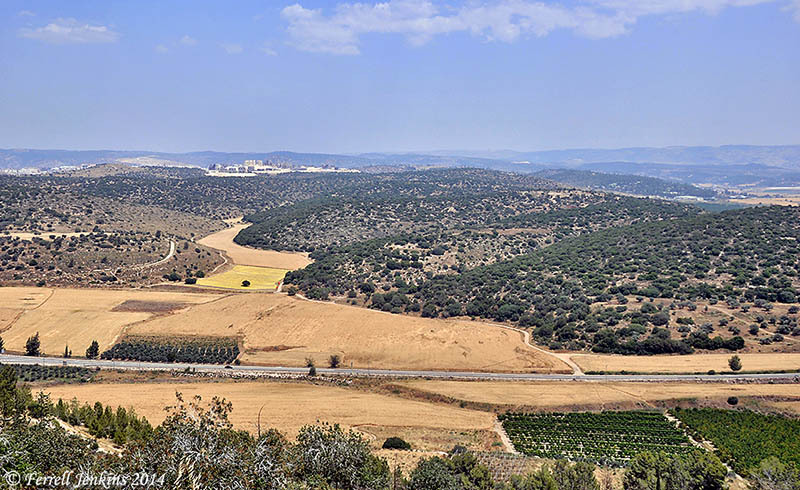 The road below the tel runs across the Valley of Elah. In the distant left you will see a white area on the hill with high-rise apartments under construction. The discovery was made near this large construction area. Left of the construction, Tel Yarmuth (Jarmuth, Joshua 10:3, 5, 23; 12:11; 15:35) rises above the trees. Khirbet Qeiyafa is on the hill in the right of the photo. View from Azekah toward Ramat Bet Shemesh and Tel Yarmuth (Jarmuth). Photo by Ferrell Jenkins, made May 4, 2013. 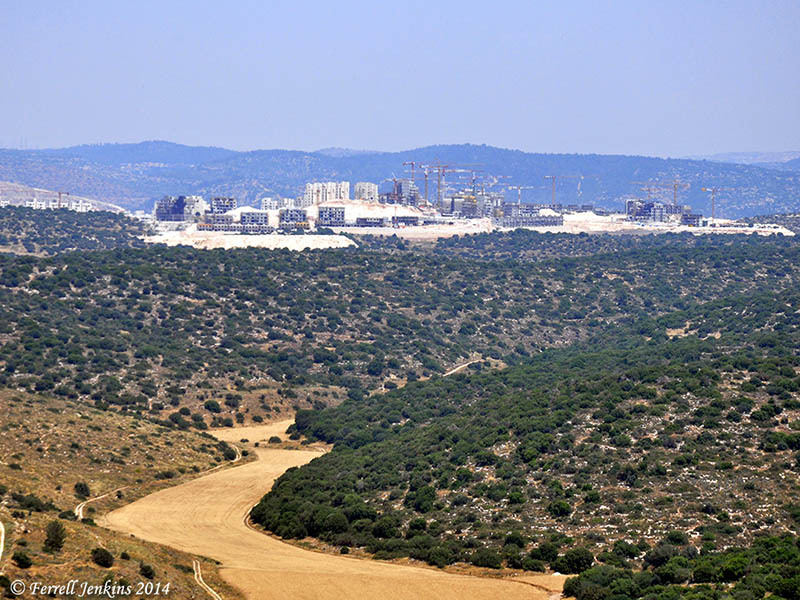 The next photo is a zoom shot of the construction area in May, 2013, from Tel Azekah. Tel Yarmuth is just off the left of the photo, as well as the town of Ramat Bet Shemesh. The construction area from Azekah. Photo by Ferrell Jenkins. The Khirbet Qeiyafa excavation has been concerned about this new community and its possible encroachment upon the site. Luke Chandler reported on the threat here. 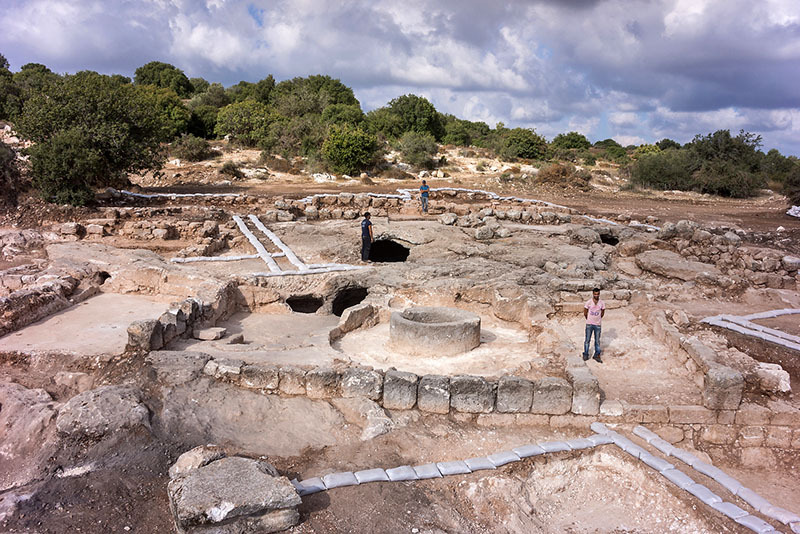 This entry was posted in Archaeology, Bible Lands, Bible Places, Bible Study, Israel, Old Testament, Photography, Travel and tagged Bet Shemesh, Beth Shemesh, Byzantine, Israel Antiquities Authority. Bookmark the permalink.